Each child’s favorite place is a playground where you can play actively. The most favorite is the slide, on which even some adults are not against a ride. Today, in specialized stores you can find a huge range of playgrounds of different configuration, made of different materials. Naturally, such a purchase will be expensive, and it cannot be argued that the quality of the product will be appropriate. Therefore, more and more often parents decide to equip the playing area on their own. 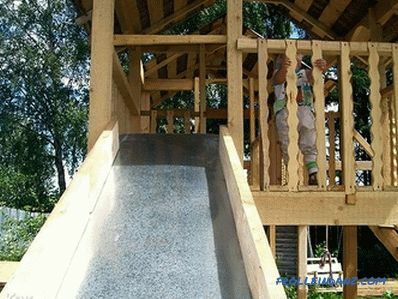 So, with minimal financial and time costs, a full-fledged children's slide in the country can do it yourself. the ability to withstand large load. to ensure a soft landing, for example, on sand or thick grass. An equally important issue is climbing the hill. Ladder must be equipped with handrails on both sides. Additional protections are also welcome: stability and reliability. So, when choosing a tree as the main material, it is necessary to choose the fasteners correctly - nuts, washers and bolts. Descent guides are fixed on a special glue - this will ensure good sliding. The stability of the slide will provide even a simple foundation, and reliability depends on the choice of quality materials for assembling a children's slide and a playground. Before you make a children's slide at your summer cottage, you must decide not only on the design, but also on the location. So, the ideal option would be a zone with a good view from all sides, it will allow parents to monitor their child all the time. In most cases, the slide is installed on the playground, but you can also place it outside the complex. The location chosen should be both sunny and near trees or a building. An excellent option would be a playground next to the garden, at certain times a shadow will emanate from it, which means children will not overheat. It is not recommended to place a children's slide in the household yard, next to the garage or other buildings. During the game, children can be injured by tools or scattered building materials. What material should be preferred? 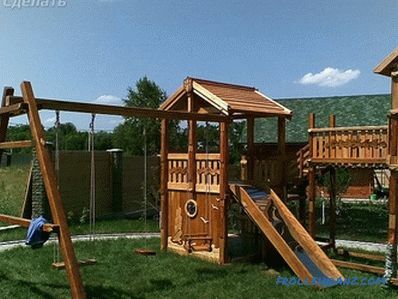 Despite the huge range of building materials, only wood or metal will be suitable for arranging a children's slide. Despite the fact that the design will be of the same type for both the first and second variants, the manufacturing process will be completely different. 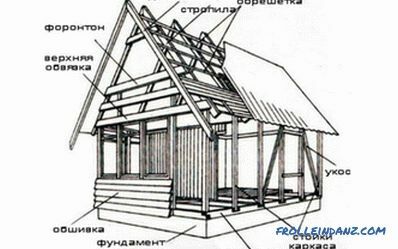 This is explained by the fact that each material has its own characteristics, which should be considered before making the final choice and starting to study the technology of construction of the structure. At the very beginning, you should pay attention to the fact that without a welding machine it will be quite difficult to make a slide. Therefore it is necessary to have the minimum skills and the welding machine itself. In addition, we should not forget that the metal is a capricious material, which, when heated (during welding), can be deformed and bent. Any idea without special knowledge of working with metal can end up differently than it was originally intended. does not pose a danger to the life of the child if the installation technology is observed. Bulgarian with special nozzles (for polishing wood). Even a newcomer to the construction business can easily cope with the task.Unlike metal, a slide made of any lumber has practically no flaws, and if they exist, they are insignificant and can be easily eliminated. For example, if it is necessary to protect the structure from moisture, it is enough to treat it with special means of protection, as well as paint it with any paintwork material. This will create a protective layer. It is also worth noting that when considering the option of buying a ready-made children's play complex or slide, you can consider another option - plastic. 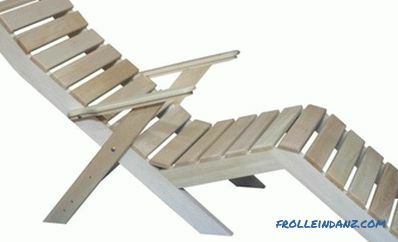 In most cases, manufacturers combine it with wood or metal, so you can get a variety of shapes and designs of slides. Each decides for himself what material to use to make a children's slide. 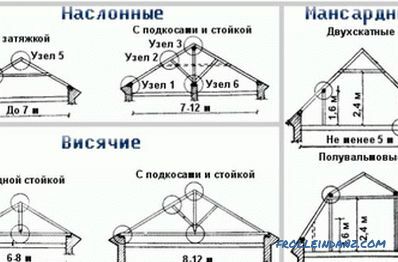 But, if you encounter a similar problem for the first time and do not have welding skills, then the choice is obvious - wood. There is one more "but" when choosing a metal. Scrap metal collectors can take advantage of the lack of home owners and recycle the structure. First you need to make a platform that will be installed at the top. It is from her children will begin the descent. This stage is quite simple: a rectangle is assembled from a bar and is sheathed on one side with boards. It is better to give preference to a grooved board, since there will be practically no gaps and joints, and therefore, the risk of injury to the product will be minimized. When the platform is ready it is necessary to attach legs to it, as a result of which a rather high stool is obtained. That is why the process of fastening is no different: 4 legs are attached to the corners. For greater stability, they are tied together by horizontal bridges in several places (depending on the height of the children's slide). So, for the slide, a height of 1.5 m, jumpers are required in the middle and below. When the “stool” is fully ready, you can start creating a ladder, along which children will climb up. There is nothing complicated about this either: 2 parallel poles are installed, which are attached to the upper edge of the structure. To connect using horizontal crossbar, they will also perform the function of steps. 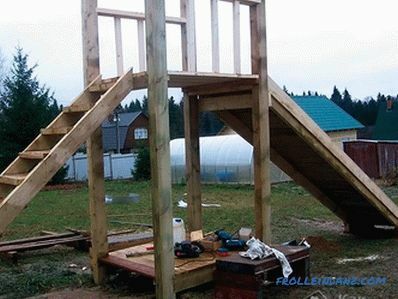 If desired, and the availability of free time, you can construct a standard staircase with steps and risers. Safety lift ensure handrails. For their manufacture install several vertical supports, which are attached to the railing. The main stage is the descent. It should be noted that for it you can use the same technology as when creating the stairs, with only one difference: a sheet of plywood is installed on the parallel poles. Also on the sides it is necessary to create a low limit so that the child does not fly out of the slide during the descent. 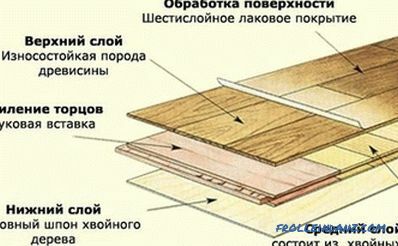 For this, thick and wide planks are screwed from the sides, the height of which should be more than 10 cm above the plywood sheet. The final stage will be the grinding and painting of the structure. All wooden elements must be free of burrs and sharp corners that can scratch the skin of a child. For these purposes, you can use the grinder with a special disk nozzle, which quickly clears all the irregularities. As a protective layer can be used as a varnish and paint. After the design dries, you need to install a sheet of tin on the trigger to ensure perfect sliding. At the final stage, you can show imagination. So, you can use several colors of paint to give a children's slide bright accents. On the descent, you can draw any picture using a carbon copy. When choosing lumber, you must check their quality. Also, all the elements are twisted, painted, and the nails are well hammered so that the caps do not stick out. There should be a soft covering around the hill, which is chosen depending on your own preferences or situations. 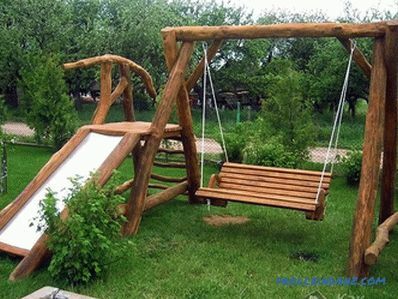 To do this, you can use: sand, thick grass (lawn) or artificial materials. The legs of the stairs, as well as the lower parts of the stairs and the descent, must be immersed in the foundation. 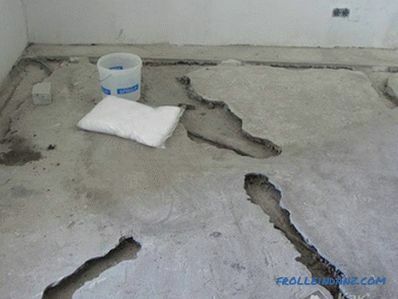 This will ensure maximum fastening and structural strength. 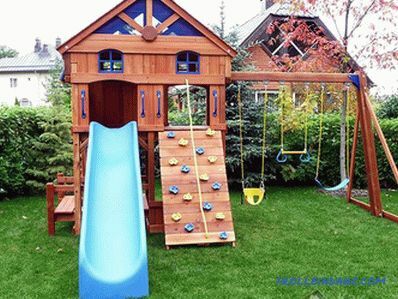 All the space around the slide must be cleaned of unnecessary objects so that the kids do not stumble during the games. Sticks, stones and glass should be removed. Only a high-quality children's slide will contribute to the proper development of the child, maintain his fitness and allow him to lead a healthy lifestyle. The playground is a kind of stimulator for the full development of the growing body. In addition, every child will enjoy daily fun and active games. As you can see, it’s quite simple to design a children's slide with your own hands - you only need to follow the step-by-step instructions. In addition, the climb to the hill can be made not only in the form of a ladder. You can use the remaining 2 sides to equip other lifting options. They will also affect the proper development of the child's body. If you have free time and desire, you can develop a whole game complex, in which, besides the slide, there will be a sandbox and a swing. how to make a pond at the cottage.